Where you sit in relation to other people is an effective way of obtaining co-operation from them. Aspects of their attitude towards you can also be revealed in the seating position they take relative to you. The first major study in seating positions was conducted by psychologist Robert Sommer from the University of California, who analyzed a cross-section of students and children in public and social situations such as bars and restaurants. Sommer's findings were correlated with survey data collected at business meetings that targeted what seating positions business people felt communicated certain specific attitudes. 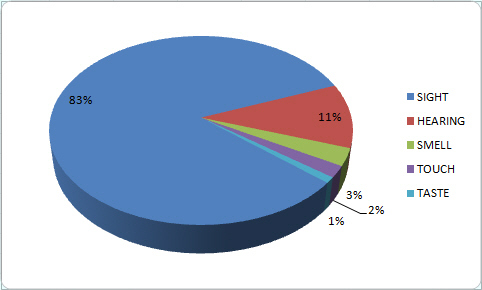 This survey information was synthesized with and applied to seating positions in business and negotiation situations. While there are stylistic differences between cultures and their relationships between people, the seating positions you will encounter most of the time in most situations have been summarized here. In his book Non-Verbal Communication in Human Interaction, Mark Knapp from the University of Vermont noted that, although there is a general formula for interpretation of seating positions, the environment may have an effect on the position chosen. Research conducted with middle-class people showed that seating positions in public bars can vary from the seating positions taken in a high-class restaurant. The direction the seats are facing and the distance between tables can also have a distorting influence on seating behavior. For example, intimate couples prefer to sit side by side wherever possible, but in a crowded restaurant where the tables are close together this is not possible and the couples are forced to sit opposite each other in what is normally a defensive position. Keeping that in mind, let us look at some main seating choices we all have in a variety of circumstances at work and socially. You will interview someone for a job in a small, friendly company. You are going to review business documents displayed on a laptop with someone. You are going to play chess against someone. You are in a public library and don't want any involvement. Look at the next illustration and make your choices. You took, B1, the Corner Position, to conduct the interview, as this allows you to see the person clearly without seeming competitive or aggressive, as you might in B3, or too familiar as in B2. You sat in position B2, the Co-operative Position, to review and discuss the documents collaboratively; any of the other positions would prove very awkward as the laptop could not be viewed simultaneously by both people. You chose position B3 to play chess against the person. This is called the Competitive/Defensive Position and is the one we choose to compete against an adversary because it lets us have a full view of their face and what they're doing. Finally, you used the Diagonal Position, B4, in the library to communicate your independence or non-involvement. This position is used by people who are engaged in friendly, casual conversation. It allows for good eye contact and the opportunity to use numerous gestures and to observe the gestures of the other person. The corner of the desk provides a partial barrier in case one person begins to feel threatened, and this position avoids territorial division of the table. This is the most successful strategic position from which person B can deliver a presentation, assuming that person A is the audience. By simply having the chair in the location occupied by person B you can relieve a tense atmosphere and increase the chances of a positive outcome. When two people are thinking alike or both working on a task together, this position often occurs. Most people choose this position as the most co-operative, or intuitively took it when asked to work jointly with another person. 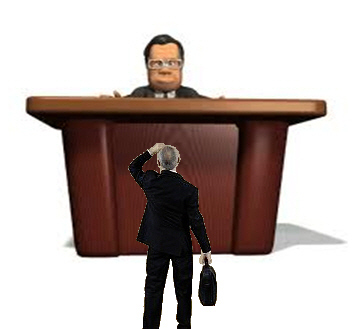 It is one of the best positions for presenting your case and having it accepted because it allows good eye contact and the opportunity for mirroring. The trick is, however, for person B to be able to move into this position without person A feeling as if her territory has been invaded. The technical expert is seated at position C opposite customer A. 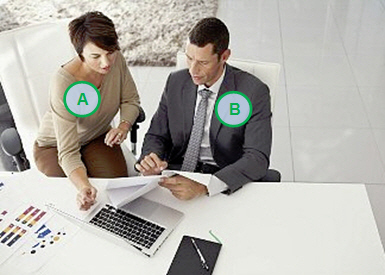 The salesperson sits at either position B2 (Cooperative) or B1 (Corner). This allows the salesperson to be 'on the client's side' and to ask the technician questions on behalf of the client. This position is known as 'siding with the opposition'. In this arrangement, competitors face each other, just like Western gunslingers. Sitting across the table from a person can create a defensive, competitive atmosphere and can lead to each party taking a firm stand on his point of view because the table becomes a solid barrier between both parties. In business scenarios, 56% of respondents saw this as a competitive position but in social situations, such as a restaurant, 35% saw it as conversational. It's the most commonly observed restaurant sitting position on the dating scene, but this is mainly because waiters seat people at tables this way. It works with a couple in a restaurant because it allows good eye contact while subtly highlighting gender differences by being 'opposite'. In a work environment, however, this position is taken by people who are either competing with each other or if one is reprimanding the other. It can also be used by A to establish a superior/subordinate role when it's used on A's territory. In business scenarios the findings are that people speak in shorter sentences from the Competitive/Defensive Position, can recall less of what was said and are more likely to argue. A social research firm conducted an experiment in doctors' offices that showed that the presence or absence of a desk had a significant effect on whether a patient was at ease or not. Only 10% of patients were perceived to be at ease when the doctor's desk was present and the doctor sat behind it. This figure increased to 55% when the desk was absent. An experiment was conducted where 250 senior managers and 100+ lower/middle managers were asked to sketch the furniture arrangement they preferred to have in their offices when relocating to a new building. 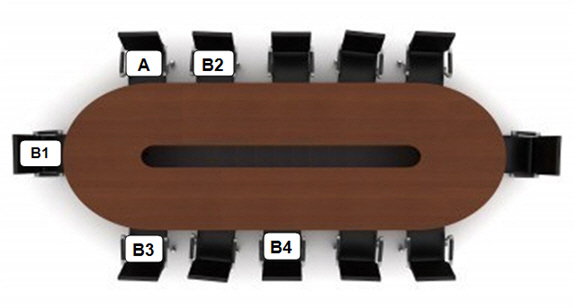 A full 76% of the senior managers (185) drew a sketch placing their desks between themselves and their subordinates. Only 50% of the lower managers did this and male managers were twice as likely as females to put the desk between them and others. The most interesting finding was how other staff members perceived the managers who did not have their desks placed like a barrier. These managers were described by their staff as more fair-minded, more prepared to listen to their ideas without criticism and less likely to show favoritism to others. Sitting directly opposite others can create negative energy. 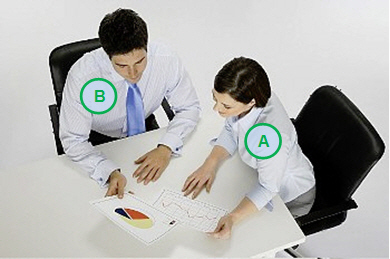 If B is seeking to persuade A, the Competitive Position reduces the chance of a successful negotiation, unless B is deliberately sitting opposite as part of a pre-planned strategy. For example, it may be that A is a manager who has to reprimand employee B, and the Competitive Position can add weight to the reprimand. On the other hand, if B wants to make A feel superior, B can deliberately sit directly opposite A. Whatever business you're in, if it involves dealing with people you are in the influencing business and your objective should always be to see the other person's point of view, to put him at ease and to make him feel right about dealing with you; the Competitive Position does not lead to that end. More cooperation will be gained from the Corner and Co-operative Positions than will ever be achieved from the Competitive Position. Conversations are significantly shorter and more pointed in the Competitive Position. This is taken by people when they don't want to interact with each other. It occurs between strangers in places such as libraries, park benches or restaurants and is the position we refer to when we say we are 'diametrically opposite' to an idea. To 40% of the surveyed, the message it conveyed was a lack of interest and it was read by some as showing indifference or hostility. This position should be avoided where open discussions between people are your goal. Rectangular tables create a competitive or defensive relationship between people because each person has equal space, equal frontage and separate edges. It lets everyone take a 'position' on a given subject and allows more direct eye contact across the table. Square tables are ideal for having short, to-the-point conversations or for creating superior or subordinate relationships. Most co-operation comes from the person seated beside you, and the one on the right tends to be more co-operative than the one on the left. Historically, the person on the right is less likely to be able to successfully stab you with their left hand, hence the 'right-hand man' is more favored and others subconsciously credit the right-hand person with having more power than the one on the left side. Most resistance comes from the person seated directly opposite in the 'gunslinger' position and, when four people are seated, everyone has someone sitting opposite. 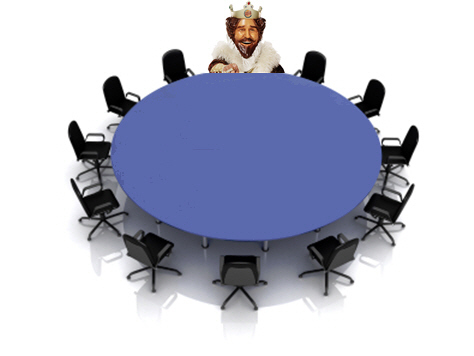 King Arthur used the Round Table as an attempt to give each of his knights an equal amount of authority and status. A round table creates an atmosphere of relaxed informality and is ideal for promoting discussion among people who are of equal status, as each person can claim the same amount of table territory. The circle itself has become a worldwide symbol of unity and strength and simply sitting in a circle promotes the same effect. Unfortunately, King Arthur was unaware that if the status of one person is higher than the others in the group it completely alters the dynamics of group power. The king held the most power and this meant that the knights seated on either side of him were silently granted the next highest amount of power, the one on his right having more than the one on his left. The power then diminished relative to the distance that each knight was seated away from the king. The knight seated directly opposite King Arthur was, in effect, in the Competitive/Defensive position and was likely to be the one to give the most trouble. Sixty-eight per cent of respondents saw the person sitting directly opposite them on a round table as the one most likely to argue or be competitive. Fifty-six per cent also said that sitting opposite could be used to show non-involvement or lack of interest, as in a public library. When sitting directly beside another person, 71 % said they were either having a friendly conversation or co-operating. 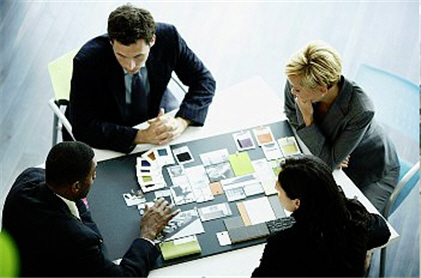 Many of today's business executives use rectangular, square and round tables. The rectangular desk, which is usually the work desk, is used for business activity, brief conversations, reprimands and so on. The round table, often a coffee table with wrap-around seating or lower chairs, is used to create an informal relaxed atmosphere or to persuade. It is also often found in families that practice democracy or don't have a dominant parent. Square tables belong in a canteen. 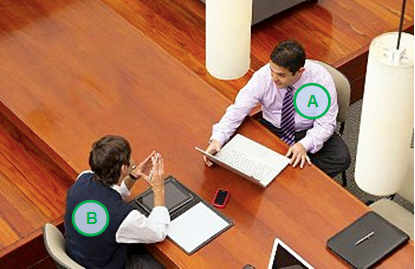 Let's assume that you, person C, are going to talk with persons A and B, and that you are all sitting in a triangular position at a round table. Assume that person A is talkative and asks many questions and that person B remains silent throughout. When A asks you a question, how can you answer him and carry on a conversation without making B feel excluded? Use this simple but effective inclusion technique: when A asks a question, look at him as you begin to answer, then turn your head towards B, then back to A, then to B again until you make your final statement, looking finally at A again as you finish your sentence. This technique lets B feel involved in the conversation and is particularly useful if you need to have B on side with you. On a rectangular table, it seems to be a cross-cultural norm that position A has always commanded the most influence, even when all people at the table are of equal status. In a meeting of people of equal status the person sitting at position A will have the most influence, assuming that he/she doesn't have their back to the door. 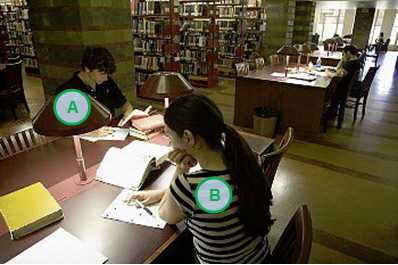 If A's back was facing the door, the person seated at B would be the most influential and would be strong competition for A. 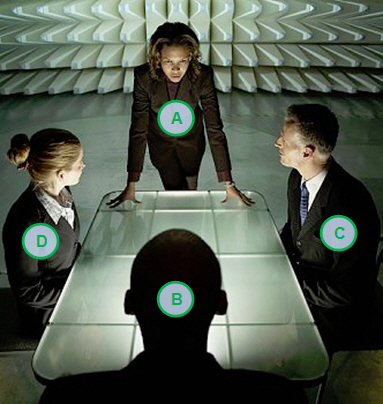 A legal research firm set up some experimental jury deliberations which revealed that the person sitting at the head position was chosen significantly more often as the leader, particularly if that person was perceived as being from a high economic class. 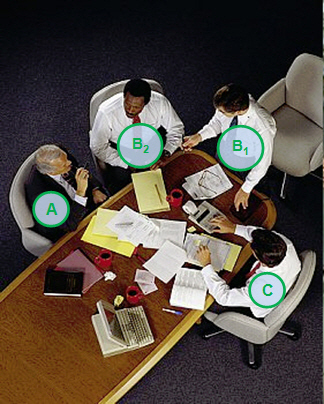 Assuming that A was in the best power position, person B has the next most authority, then D, then C. Positions A and B are perceived as being task-oriented while position D is seen as being occupied by an emotional leader, often a woman, who is concerned about group relationships and getting people to participate. 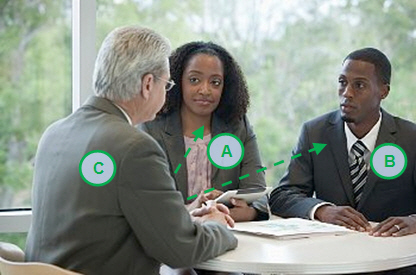 This information makes it possible to influence power plays at meetings by placing name badges on the seats stating where you want each person to sit. This gives you a degree of control over what happens in the meeting. Researchers at the University of Oregon determined that people can retain up to three times more information about things they see in their right visual field than they do in their left. Their study suggests that you are likely to have a 'better side' to your face when you are presenting information to others. According to this research your better side is your left because it's in the other person's right visual field. Studies show that the left side of your face is the best side for giving a presentation. Dr John Kershner of Ontario Institute for Studies in Education studied teachers and recorded where they were looking every 30 seconds for 15 minutes. He found that teachers almost ignore the pupils on their right. The study showed that teachers looked straight ahead 44% of the time, to the left 39% of the time and to their right only 17% of the time. He also found that pupils who sat on the left performed better in spelling tests than those on the right and those on the left were picked on less than those on the right. Other researchers found that more business deals are made when a salesperson sits to the customer's left than to their right. So, when you send a child to school, teach them to jockey for the teacher's left side but, when they become adults and attend meetings, tell them to go for the extra perceived power given to the person on their boss's right. The shape of a family dining-room table can give a clue to the power distribution in that family, assuming that the dining-room could have accommodated a table of any shape and that the table shape was selected after considerable thought. 'Open' families go for round tables, 'closed' families select square tables and 'authoritative' types select rectangular tables. Next time you have a dinner party, try this experiment: place the shyest, most introverted guest at the head of the table, furthest from the door with their back to a wall. You will be amazed to see how simply placing a person in a powerful seating position encourages them to begin to talk more often and with more authority and how others will also pay more attention to them. The Book of Lists - a volume that lists each year all sorts of information about human behavior - shows public speaking as our number one fear, with fear of death ranking, on average, at number seven. Does this mean that, if you're at a funeral, you're better off being in the coffin than reading the eulogy? If you are asked to address an audience at any time, it's important to understand how an audience receives and retains information. First, never tell the audience you feel nervous or overawed - they'll start looking for nervous body language and will be sure to find it. They'll never suspect you're nervous unless you tell them. Second, use confidence gestures as you speak, even if you're feeling terrified. Use Steeple gestures, open and closed palm positions, occasional Protruding Thumbs and keep your arms unfolded. Avoid pointing at the audience, arm crossing, face touching and lectern gripping. Studies show that people who sit in the front row learn and retain more than others in the audience, partially because those in the front row are keener than others to learn and they show more attention to the speaker in order to avoid being picked on. People who sit in the front rows learn more, participate more and are more enthusiastic. Those in the middle sections are the next most attentive and ask the most questions, as the middle section is considered a safe area, surrounded by others. The side areas and back are the least responsive and attentive. When you stand to the audience's left - the right side of the stage - your information will have a stronger effect on the right brain hemisphere of your audience's brains, which is the emotional side in most people. Standing to the audience's right - the left side of stage - impacts the audience's left brain hemisphere. This is why an audience will laugh more and laugh longer when you use humor and stand to the left side of the stage, and they respond better to emotional pleas and stories when you deliver them from the right side of the stage. Comedians have known this for decades - make them laugh from the left and cry from the right. Using metrics employed by researchers Robert Sommer, and Adams and Biddle, a study of audiences was conducted to estimate how much participation was given by attendees based on where they were sitting in a seminar room and how much they could recall of what the presenter was saying. Results were remarkably similar to the original Robert Sommer study, even though participants were adults and Sommer's subjects were students. High-status individuals sit in the front row in most places - most notably in Japan - and they participate the least. Consequently, audience data was collected only where attendees were generally of equal status. The result was what we call the Funnel Effect. To simplify metaphorically, imagine overlaying the graphic above on the layout of your basic classroom, with the front of the room on the right hand side of the graphic. There is a 'learning zone' shaped like a funnel, which extends directly down the center of an audience and across the front row. Those sitting in the 'funnel' participate the most, interacting the most with presenters, and have the highest recall about what is being discussed. Those who participate the least sit in the back or to the sides, tend to be more negative or confrontational and have the lowest recall. The rear positions also allow a person a greater opportunity to daydream, surf the Internet, sleep or escape. We know that people who are most enthusiastic to learn choose to sit closest to the front and those who are least enthusiastic sit in the back or to the sides. A further experiment was conducted to determine whether the Funnel Effect was a result of where people chose to sit, based on their interest in the topic, or whether the seat a person sat in affected their participation and retention. Name cards had been placed on people's seats so they could not take their usual positions. Enthusiastic people were intentionally seated to the sides and back of the room and well-known back-row inhabitants were seated in the front. This strategy not only increased the participation and recall of the normally negative people who were forced to sit up front, it decreased the participation and recall of the usually positive people who had been relegated to the back. This highlights a clear teaching strategy - if you want someone really to get the message, put them in the front row. Some presenters and trainers have abandoned the 'classroom style' meeting concept for training smaller groups and replaced it with the 'horseshoe' or 'open-square' arrangement because evidence suggests that this produces more participation and better recall as a result of the increased eye contact between all attendees and the speaker. Bearing in mind what has already been said about human territories and the use of square, rectangular and round tables, let's consider the dynamics of going to a restaurant for a meal, but where your objective is to get a favorable response to a proposition. If you are going to do business over dinner, it's a wise strategy to complete most of the conversation before the food arrives. Once everyone starts eating the conversation can come to a standstill and alcohol dulls the brain. After you've eaten, the stomach takes blood away from the brain to help digestion, making it harder for people to think clearly. While some men hope to achieve these types of effects with a woman on a date, it can be disastrous in business. Present your proposals while everyone is mentally alert. No one ever makes a decision with their mouth full. A hundred thousand years ago, ancestral man would return with his kill at the end of a hunting day and he and his group would share it inside a communal cave. A fire was lit at the entrance to the cave to ward off predators and to provide warmth. Each caveman sat with his back against the wall of the cave to avoid the possibility of being attacked from behind while he was engrossed in eating his meal. The only sounds that were heard were the gnashing and gnawing of teeth and the crackle of the fire. This ancient process of food sharing around an open fire at dusk was the beginning of a social event that modern man re-enacts at barbecues, cookouts and dinner parties. Modern man also reacts and behaves at these events in much the same way as he did over a hundred thousand years ago. Now to our restaurant or dinner party: getting a decision in your favor is easier when the other person is relaxed and his defensive barriers have been lowered. To achieve this end, and keeping in mind what has already been said about our ancestors, a few simple rules need to be followed. First, whether you are dining at home or at a restaurant, have the other person sitting with his back to a solid wall or screen. Research shows that respiration, heart rate, brainwave frequencies and blood pressure rapidly increase when a person sits with his back to an open space, particularly where others are moving about. Tension is further increased if the person's back is towards an open door or a window at ground level. So this a good position to seat someone when you want to unnerve or rattle. Next, the lights should be dimmed and muffled background music should be played to relax the senses. Many top restaurants have an open fireplace or fire facsimile near the entrance of the restaurant to recreate the effects of the fire that burned at the ancient cave feasts. It would be best to use a round table and to have the other person's view of other people obscured by a screen or large green plant if you want a captive audience. Top restaurants use these relaxation techniques to extract large amounts of money from their customers' wallets for ordinary food, and men have been using them for thousands of years to create a romantic atmosphere for their women. It's far easier to obtain a favorable decision under these circumstances than it will ever be in restaurants that have bright lighting, tables and chairs placed in open areas and the banging of plates, knives and forks. Seating positions should not be accidental; placing certain people in specific positions can affect the outcome of a meeting. The next time you go to a meeting with anyone, ask yourself: who is the person you want to influence most and where is the best position to sit to achieve this? Who is likely to want to argue or oppose? If there is no appointed leader, who has claimed a seating position to give themselves the most power? If you want to control, where should you sit? The answers to these questions will not only give you a powerful edge, they will prevent others from trying to dominate or control the meeting.